Portland truly is beervana. Thanks to clean mountain water and a perfect environment for growing an abundance of hops and high quality grain, Oregon has enjoyed a long brewing history. When I started looking at beer places to visit in Portland, I quickly realized that there was way more places then we actually had time for, so I had to narrow it down to the ones that were recommended and/or the ones I had already heard about. Henry's 12th Street Tavern - Restaurant and bar with over 100 beer on tap. It was pretty crowded and busy when we arrived Saturday evening, and were told it would be a 20 ~ 30 min wait for a table, but we were seated in less then 10. I had been on the Brew Bus tour during the afternoon and was a little "beered out" for the day, but enjoyed a S1NISTOR Black Ale from 10 Barrel Brewing before dinner and a Hair of the Dog Blue Dot IPA with my steak. Located in the Pearl District of downtown, its a little upscale and reminded me of the Tap House Grill in Seattle. Great food and a nice tap list. Horse Brass Pub - A Portland institution that was definitely on my list of places that I want to visit. Traditional English pub atmosphere but with 50+ beers tap, most of them being beers I haven't tried or even heard of. We had just had dinner at Henry's, so we only stayed long enough for a couple of beers. Most of the reviews complained about surly staff, but our server was relatively friendly, just a little slow at bringing the check. Its a little out of the way, but certainly worth going to. Higgin's Restaurant and Bar - I originally found out about Higgin's on the Beer Nutz TV show. The hosts on the show were terrible but they did showcase some great beer places around the country and this was one of them. Small and quiet, particularly when compared to Henry's, we sat in the bar area instead of the main restaurant. 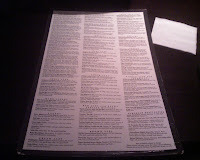 The tap menu is not large at only 12, but the bottle menu is quite extensive. We shared an appetizers and what was probably the best burger I've ever had. Its made from spiced beef sirloin freshly ground at the restaurant each day. It was here that I finally got to have my first Fred brewed by Hair of the Dog. There are still so many more beer places that I want to visit in Portland and I'd love to attend the Oregon Brewers Festival at least once. My wife liked Portland as well and loved the time we spent along the Oregon coast, so chances are pretty good that we'll actually get back up there again. One extra thing I'll note is that there are Rogue Brewing and Laurelwood Brewing pubs located inside security at the Portland airport. We had dinner and a few beers at the Laurewood pub as the Rogue was already closed (our flight left at midnight). There was also a vendor cart outside our gate that sold almost every Rogue beer in 22oz bottles as well as growlers of Dead Guy Ale and you can carry your purchases onto the plane! Unfortunately, the vendor card was already closed as I probably would have purchased a few more bottles.